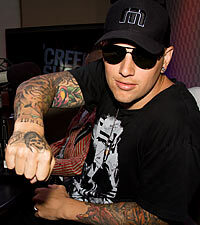 When Avenged Sevenfold walked into the ''Creep Show' studio, it was two days after their new album, 'Nightmare,' hit shelves, and industry insiders were buzzing over the fact that the record might debut at number one on the sales charts. 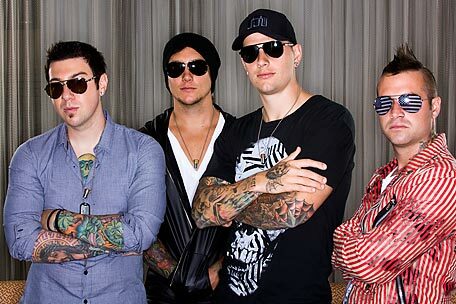 That's a huge coup for A7X, who have been clawing their way to the top for the past decade, especially given the sensitive circumstances surrounding the band over the past seven months. Drummer Jimmy 'The Rev' Sullivan passed away unexpectedly in December, and the band was in a very vulnerable, touch-and-go position and the entire metal community shared in the loss. Put simply, the band deserved the accolade of debuting at the top spot, and guess what? They achieved it! 'Nightmare' landed at number one on the Billboard sales charts, selling over 160,000 copies. It's a huge moment for the band -- and for metal! So congrats to A7X on their massive accomplishment. The band talked about Dream Theater's Mike Portnoy filling in on the record and in the live setting, which should be fun, since he looks nothing like the clean-shaven, tattooed boys of A7X! We reminisced about Avenged opening for Symphony X and Blind Guardian at New york City's now-defunct World in Times Square and how their 'death bat' logo was iconic and recognizable even back in 2003. We also talked about how 'Waking the Fallen' is one of my favorite albums of the '00s and how they've continued to expand upon their core sound with 'Nightmare.' They hinted at some of the "surprises" in store for the upcoming Uproar tour, which kicks off this month, and how they've always done what they said they were going to do. In perhaps the interview's most touching moment, the band spoke about the outpouring of fan support in the immediate wake of the passing of The Rev, which included a scrapbook full of photos and condolences. While A7X may have been the band some elitists loved to hate, there's no mistaking that the band injected hard rock and metal with an incredibly modern feel -- and that whatever s--- the keyboard ninjas want to spew, it's fine by them. They'll keep making music, playing by their rules and getting their music into the ears of their adoring fans. Welcome to Avenged Sevenfold's 'Nightmare,' this may be one that you don't want to wake up from!